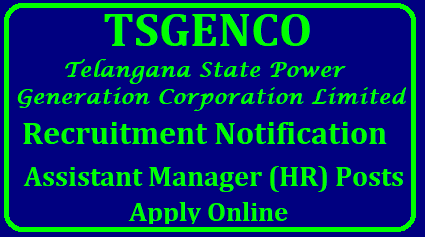 TSGENCO Recruitment 2018 | 33 Assistant Manager (HR) Jobs @ www.tsgenco.co.in | TSGENCO Recruitment 2018 | TSGENCO JAO Posts 2018 Notification | TSGENCO Assistant Managers 2018 Notification | TSGENCO Recruitment 2018 for Assistant Manager (HR) Posts | TSGENCO Assistant Manager Recruitment 2018 – Telangana GENCO Assistant Manager Jobs @ tsgenco.telangana.gov.in | TSGENCO Recruitment 2018 – Apply Assistant Manager 33 Post | TSGENCO Recruitment 2018 – Apply Assistant Manager 33 Post | TSGENCO 2018 Assistant Manager (HR) Posts – 33 Vacancies | M.B.A (HR) | Apply Now | tsgenco-assistant-manager-recruitment-notification-2018-apply-online-tsgenco.cgg.gov.in-important-dates-syllabus-model-question-papers-hall-tickets-answer-key-results-download. The State of Telangana is going to release 33 Assistant Manager (HR) posts under Power Generation Corporation Limited (TSGENCO). Eligible graduates may check the official site www.tsgenco.co.in and www.tsgenco.cgg.gov.in to get the detailed information like age limit, Education Qualifications, Scale of Pay, Selection criteria and other information. Application will be done through online mode. Must have passed MBA (HR) or MSW or 2 years Diploma in personnel Management/Human Resource/Industrial relations. A degree in Law is desirable. 8 years post qualification experience in the field of personnel management in a reputed Manufacturing company. Selected candidates will get monthly pay Rs. 41155/- Rs. 63600/- including all allowances. Candidates should have register for TSGENCO JAO Recruitment 2018 posts through online mode.